RANGOON, Burma — It is a sign of the times that a journalist in Burma is writing about a freedom of expression clampdown in a neighboring country. With around 80 political prisoners freed in another amnesty on September 17 and with new Information Minister Aung Kyi announcing that the recently formed country’s press council will be liberalized, Burma is bit by bit shedding the vestiges of authoritarianism that once made the country’s military rulers notorious. 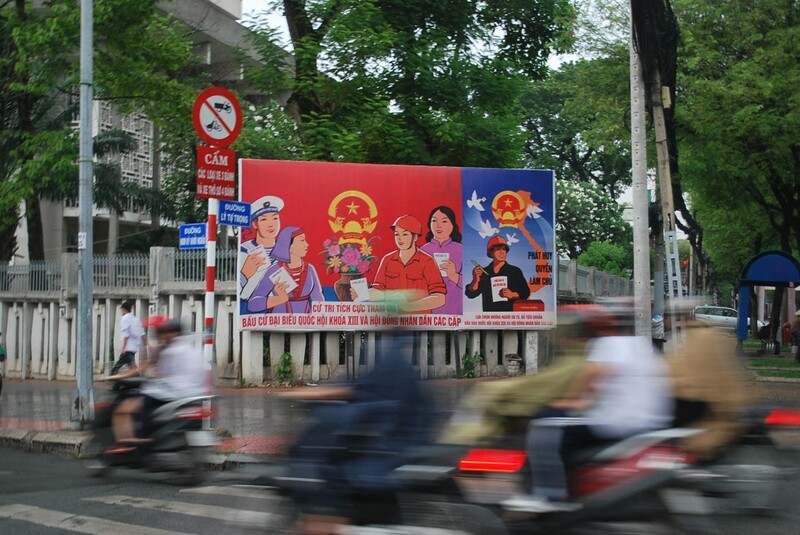 In communist-ruled Vietnam, however, the old order is holding out. “A wicked plot of the hostile forces,” was the ominous-yet-vague description coming out of Prime Minister Nguyen Tan Dung’s office on September 12, when describing three blogs that posted articles on Vietnam’s corruption and on internal squabbles inside the Communist Party. The three dissident news blogs named in the prime minister’s directive — Dan Lam Bao (“Citizen Journalists”), Quan Lam Bao (“Senior Officials Working as Journalists”) and Bien Dong — have revealed several political and financial scandals involving the Communist Party’s various factions. Citing article 88 (a) of the criminal code, the prime minister accused the blogs of anti-government propaganda and of “fabricating and distorting information and agitating against the Communist Party and state.” The day before, authorities banned civil servants from reading the blogs. Vietnam’s rulers are secretive, and discerning internal rivalries is difficult — but compelling nonetheless — for news-hungry Vietnamese. Hanoi-based lawyer Le Quoc Quan believes that online writings about a rumored power struggle between the prime minister and President Truong Tan Sang have drawn readers and irked the Communist rulers — at least those in the PM’s office. “The citizen’s press, non-official press, posting via social networks, SMS, Facebook, and blogs is an ongoing development and playing a more and more important role in the society,” says Le Quoc Quan, who serves as counsel to the Thai Ha parish in Hanoi, site of an August 26 vigil seeking the release of Catholic bloggers detained without trial since last year. Investigations are sometimes harsh, however. On September 17, the wife and sister respectively of jailed bloggers Nguyen Van Hai and Ta Phong Tan were detained and beaten by police in Bac Lieu, a southern town, according to Reporters Without Borders. Ta Phong Tan’s mother died in Bac Lieu after setting herself on fire 51 days ago outside the local party office, protesting opaque legal proceedings against her daughter, a former police officer who wrote about social issues on a blog called Conglysuthat (Justice and Truth). Nguyen Van Hai and Ta Phong Tan set up the Free Journalists’ Club in 2007 along with another jailed writer, Phan Thanh Hai. The three will face trial on September 24 — proceedings that have been postponed several times already with Nguyen Van Hai, who is better known by his pen name Dieu Cay (‘Peasant’s Pipe’), held incommunicado since authorities refused to release him in late 2010 after a prior jail term ended. That sentence was, in turn, imposed after he was rounded up during a 2008 clampdown on writers covering subjects outside the state-run media boundaries. Vietnam’s rulers have overseen a dramatic economic rise in recent decades, with 7-8% growth on average during the 1990s and 2000s, doubling GDP per capita to around US$1,100. The trade-off has been a Vietnamese people not inclined to clamor overtly for a more inclusive political system so long as the economy remained on an upward curve. As the country’s economy expanded, stories of corruption grew in tandem, and writing about graft seems to be irking a nervy government. The PM’s warning about the three blogs came shortly after the August 20 arrest of prominent banker and businessman Nguyen Duc Kien — who is said to be close to the PM — on hazy-sounding charges of “illegal business,” prompting a drop in the Vietnam Ho Chi Minh stock market index. Besides corruption, there are other economic concerns. Inflation topped 20% during 2011 — though dropped below double figures earlier this year. In the latest global competitiveness rankings issued by the World Economic Forum (WEF), Vietnam dropped from 59th in 2010 to 75th this year out of the 144 countries surveyed. In recent months, garish graft scandals and jailings involving giant but mismanaged state-owned enterprises have further dented the government’s image internationally and domestically. Now, as the economic firewall around one-party rule flickers, a defensive-sounding dictatorship seems as bent as ever on suppressing freedom of speech lest its legitimacy be questioned. Around 34 million Vietnamese are online, a higher percentage of the country’s population accessing the Internet than in ostensibly democratic neighbors Indonesia and Thailand, and these readers want news other than that of the official press, says Le Quoc Quan. The rise of the Internet in Vietnam has made it easier for Vietnamese to write, publish and read material possibly in violation of the country’s sometimes draconian and vague laws. However, the Vietnamese government is working on another law which could curb online activity, which may require foreign Internet companies to abide by the same rules as their Vietnamese counterparts, perhaps by setting up local offices and sticking to Vietnam’s censorship rules.